Eight dolphins that have spent their entire lives within the confines of the National Aquarium in Baltimore will soon be headed to North America's first seaside dolphin sanctuary. In an op-ed in the Baltimore Sun, John Racanelli, CEO of the National Aquarium since 2011, said the move is the right one for the time and has long been under consideration, especially since the dolphins stopped doing shows several years ago. He said that a decade of feedback has shown "that the American public is increasingly uneasy with the notion of keeping dolphins and whales in captivity." The move puts pressure on the other 30 or so dolphinariums in the country to consider similar arrangements, as well as marine parks such as SeaWorld, where calls for orca sanctuaries having been a regular demand from animal rights groups. It also feeds into the discussion about how to best keep animals in captivity and to balance the demands of educating the public, treating animals fairly, and furthering science and conservation. This debate reached new heights in recent weeks with the discussion surrounding the circumstances of 400-pound western lowland gorilla Harambe's death, who was shot and killed by officials at the Cincinnati Zoo after a 4-year-old boy fell into the primate’s enclosure. While even the location of the dolphin sanctuary remains under discussion—seaside spots in Florida and the Caribbean are being considered—Racanelli said there are specific criteria that will need to be met in order for it to succeed. It will be an outdoor, saltwater facility in a tropical climate that provides significant "natural stimuli," including fish, plants, and ideally other dolphins. Humans will still help care for the dolphins, and scientists will have access to perform studies in areas like dolphin communication and cognition. The dolphins range in age from seven to 44. They will be going from 1.5 million gallons of manufactured seawater to tens of thousands of gallons of natural ocean water. The new facility should be in place by 2020. 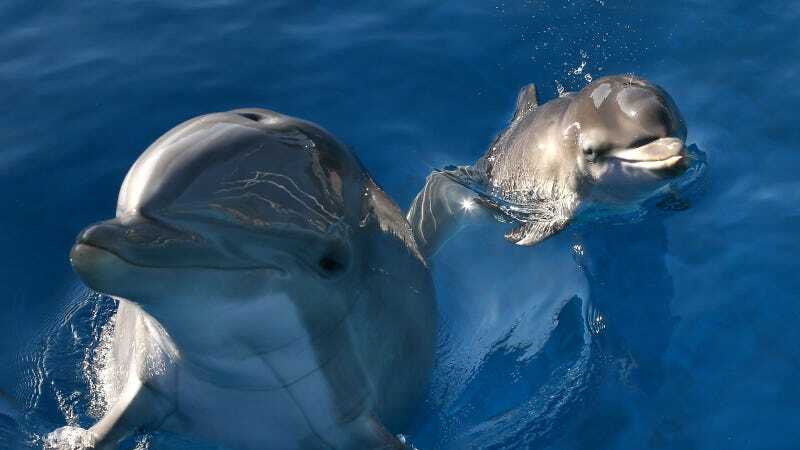 People for the Ethical Treatment of Animals (PETA), a hardline animal rights group, welcomed the news, saying it "recognizes that the needs of intelligent, sensitive, far-ranging dolphins simply can’t be met in captivity." "This spells the beginning of the end for dolphin captivity and the start of an age in which SeaWorld, the Miami Seaquarium, and other marine parks reject excuses not to retire long-suffering captive dolphins—including orcas—to sanctuaries," states the PETA release. While sanctuaries for elephants, chimpanzees, and other animals exist in North America, this is the first time a marine mammal will have a sanctuary of their own. As the general public becomes more involved with the treatment of captive animals, especially those used for entertainment purposes, the pace of change seems to be picking up. The Ringling Brothers recently announced they were retiring their elephant show after nearly 150 years and a new HBO documentary called "Unlocking the cage" draws attention to the effort to grant a limited form of legal “personhood” to chimpanzees that are caged in unpleasant settings. According to PBS NewsHour, humans have been capturing and training dolphins for performances for about 80 years, with the 1960's NBC program "Flipper" being the best known of these shows. Denise Herzing with the Wild Dolphin Project told PBS NewsHour that it's "definitely time we started looking at creating dolphin retirement centers," even though it may be more expensive than other land-based sanctuaries that serve a similar purpose. In another indication of the changing tide for marine mammals, a group of scientists and activists recently launched the Whale Sanctuary Project with the intention of creating ocean sanctuaries for dolphins and whales. In a statement responding to the National Aquarium's news, president of the Whale Sanctuary Project Dr. Lori Marino said "in taking this major step forward, the National Aquarium is demonstrating a commitment to a new model for relating to dolphins and whales, one that transforms zoos and aquariums into centers of authentic advocacy, conservation, and public education and engagement."